The American Chamber of Commerce in Azerbaijan (AmCham Azerbaijan) organized its monthly members’ luncheon with the kind support of BP. 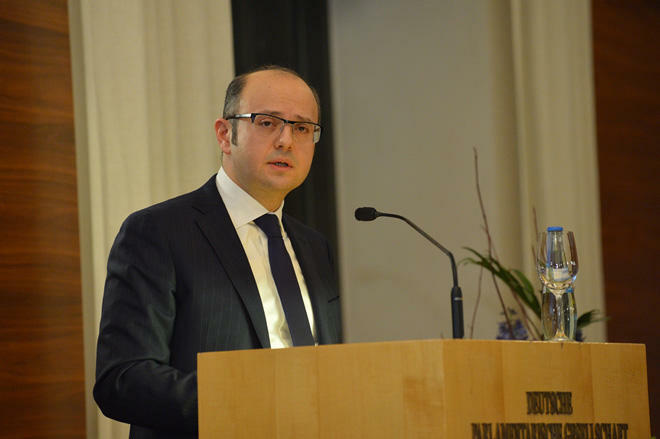 Its Guest Speaker – Mr. Parviz Shahbazov, Minister of Energy of the Republic of Azerbaijan – delivered a speech on recent and expected changes and reforms in the energy sector, alternative energy and investment opportunities. Mr. Shahbazov acknowledged AmCham members constituting a substantial portion of foreign and local investment committed to the Azerbaijani economy as being instrumental in supporting Azerbaijan’s achievements and progress. The Minister noted that the energy sector is a significant factor in bilateral relations between Azerbaijan and the United States – the first ever area to attract investments from large transnational corporations including the U.S. ones. In this respect, he particularly stressed that the investments in the country are well protected and guaranteed that creates another incentive for the investments to flow into Azerbaijan. Mr. Shahbazov spoke further on the renewable energy economic potential, emphasized the role of signing the amended and restated Azeri-Chirag- Guneshli (ACG) Contract as well as the importance of the Southern Gas Corridor project for the development of the Azerbaijani economy. Importantly, the October Luncheon highlighted also the Extraordinary General Meeting of the Chamber. Members of the Chamber in good standing voted in favour of adoption of AmCham Board of Directors eligibility criteria. In addition, the Luncheon featured member presentations by PASHA Insurance, FireWorks HRM and Deloitte Azerbaijan. More than 150 guests attended the event, including representatives of diplomatic corps. AmCham Azerbaijan Members’ Luncheons are organized monthly by the Chamber and feature participation of high ranked government officials, members of parliament and representatives of diplomatic corps. The American Chamber of Commerce in Azerbaijan is a leading private, non-profit business association supporting and promoting the interests of foreign and local businesses in Azerbaijan. Established in 1996, AmCham Azerbaijan is composed of over 280 Member-Companies and Associates active in every sector of the Azerbaijani economy. AmCham Azerbaijan represents nearly 80 percent of all foreign investment, as well as a significant portion of local investment in Azerbaijan.